Welcome! Last week we had some bloggers linking up with us for the first time. One of the things I like the most about this hop is the community and friendships that have developed through the years. 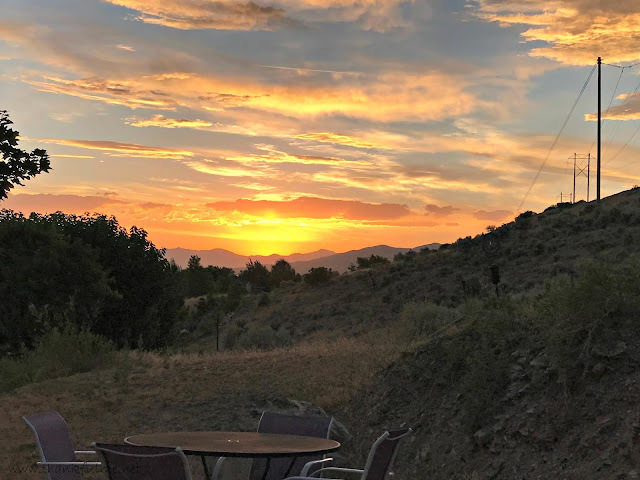 Please feel free to jump in and comment on the posts--this is a welcoming place! I hope you are all enjoying July, and staying comfortable. 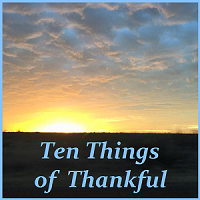 The week is coming to an end, which means the Ten Things of Thankful blog hop is open! Photo: The blue clouded sky gives way to a yellow, orange, and pink sunset. The darkness of their night. How interesting it is that gratitude is not dependent on circumstance. No matter how your week has gone, we would love to hear from you. Please join with us and share your clear sky moments or your rays of light in darkness. Whether or not you live in the United States and celebrated Independence Day, I hope you had a nice 4th of July week. Thankfulness is not dependent on citizenship, and I appreciate reading posts written from people from all over the globe. Come join in!